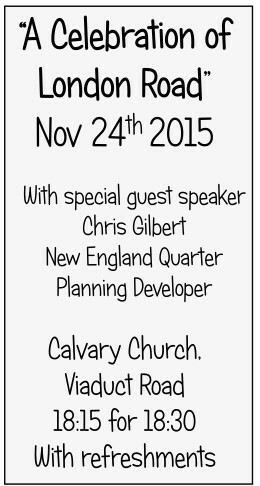 By now many locals will have received the LAT newsletter advertising the meeting on November 24th. This is an open public meeting to which all are welcome. We will be looking back over the progress and developments in London Road over the past years. There will be an opportunity to talk to some of the “main players” in the recent changes. There will be a talk from one of the key property developers in the New England area, Chris Gilbert of QED (www.qedproperty.com) – among many other things they are the people behind the Richardson’s Yard container housing project.